“My education at WSU laid the foundation for everything else I have pursued in my career,” she says. “I vividly recall sitting in Biology 101 in Bryan Auditorium with Dr. Skip Paznokas discussing the cell. The basic science courses as well as liberal arts classes were all taught by professors who truly loved to share their knowledge. Their excitement and enthusiasm really helped students find something to be passionate about. Dr. John Crane, who taught a parasitology class, had such an animated personality that it was impossible to not love what I was learning – even gross worms that infected every crevice of the human body. After receiving her M.D. from Temple University, she did her residency at New York University, and then completed subspecialty training in Female Pelvic Medicine and Reconstructive Surgery at the University of Pennsylvania. Her faculty position at Weill Cornell Medical College is in obstetrics and gynecology. 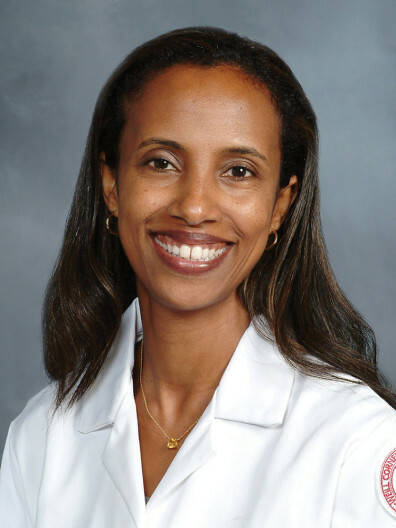 Asfaw is an assistant professor at Weill Cornell Medical College in New York City and has a practice as a urogynecologist, specializing in the care of women with pelvic floor weakness resulting in conditions such as pelvic organ prolapse and bladder dysfunction. Her husband, Fasika Tedla, is also a physician and he specializes in nephrology. The couple are parents of two daughters ages 5 and 3. Being a mother is what she considers her biggest accomplishment to date. “They are more demanding than medical school, residency and surgical subspecialty training combined but I would not want things any other way,” she says.